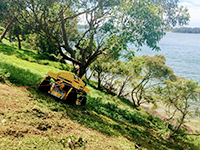 Whether you are a Contractor, Council, Road Authority, Water Authority or responsible for Public Works and Grounds Care; the Spider Mower offers a specialist mowing solution. The table shows the typical range of productivity rates that could be expected from the Spider Mower. Rate is affected the most by the degree of slope and ground conditions, grass density and operator experience. Have you had tractor or mower roll-over? Are tractors occasionally bogged and damage grounds? Losing productive time due to wet slippery conditions? 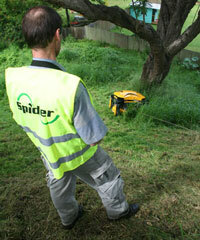 Do you use manned brush-cutters for hard to access and sloping areas? Do employees have slip injuries when brush-cutting? Tractor or mower wheel ruts causing erosion? Are waterway embankments well maintained? Weed proliferation due to infrequent cutting?